RUAG Space will be supplying the payload fairings for Mitsubishi Heavy Industries' H3 rocket via a contract that was signed at the 35th Space Symposium. The contact includes manufacturing of payload fairings and payload supporting structures for Mitsubishi Heavy Industries' (MHI) H3 launch vehicle that is to be used for three resupply missions to the International Space Station (ISS). Post development, RUAG Space will then produce three sets of payload fairings and supporting structures and will provide engineering support for the launch campaigns. 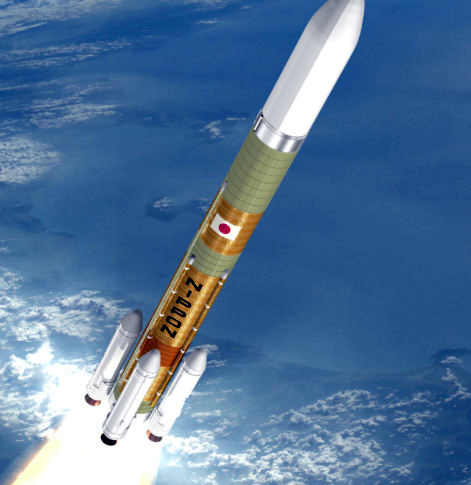 The H3 is the new Japanese flagship launch vehicle and is being developed by the Japan Aerospace Exploration Agency (JAXA) and MHI to succeed the H-IIA and H-IIB rockets. The launch vehicle will be 63 meters high with a diameter of 5.2 meters. RUAG Space payload fairings and supporting structures are planned to be used on three resupply missions to the ISS, which will be done by the HTV-X cargo spacecraft. The HTV-X is a planned successor to the HTV Transport Vehicle, which has been used for resupplying the ISS since 2009. Its first flight is expected in the Japanese Fiscal Year 2021. Artistic rendition of MHI's H3 launch vehicle. Image is courtesy of the company. RUAG offers several sizes of payload fairings, from a diameter of 0.7 meters for small launch vehicles up to 5.4 meter fairings. Almost 300 launches have taken place since 1979 with RUAG fairings on board — with 100 percent mission success. RUAG Space also develops and produces interstage adapters and other payload supporting structures. All of these are built in composite technology based on aluminum honeycomb cores with plastic face sheets reinforced by carbon fiber. This ensures the necessary combination of high stiffness and low mass. RUAG Space has manufacturing facilities in Emmen, Switzerland and Decatur, Alabama, USA. Peter Guggenbach, RUAG Space CEO, said the company is now truly global and is supplying product to the launcher industry on three continents. Masahiro Atsumi, VP and Senior GM for Space Systems at MHI, added the company is delighted to receive the support of RUAG, a highly experienced and trusted supplier of space products. 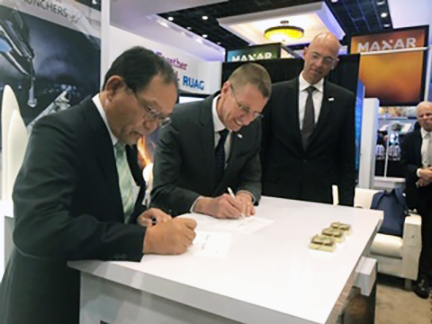 MHI has enjoyed working with a Japanese partner for standard types of fairings and supporting structures for the firm's families of launch vehicles for many years and will build a trusted partnership with RUAG to help transport critical cargo to the ISS.